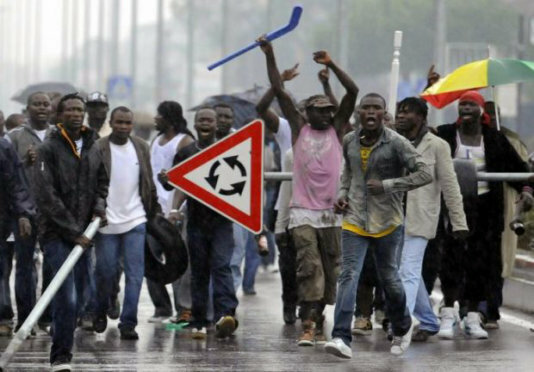 The revolt of the “African Day Labourers”, who work in the orange groves in the Calabrian Rosarno (Italy), made international headlines in January 2010. The reason behind this revolt was the armed attack by a group of village boys on the plantation workers who have been returning from work to their accommodations. This was the proverbial straw that broke the camel's back. The labourers came to the marketplace of Rosarno in Calabria to protest against inhumane living conditions, working days of 14 to 15 hours, starvation wages of 20 to 25 euros per day and against everyday racism they had to face. The African laborers came to the marketplace of Rosarno in Calabria to protest against inhumane living conditions, working days of 14 to 15 hours, starvation wages of 20 to 25 euros per day and against everyday racism they had to face. In response to this protest, the population of Rosarno organized a veritable “hunting on black”. They attacked them with baton, stones and guns. Concluding this violent attack there were thirty-seven injured laborers even though police tried to intervene and disperse the mob. That was four years ago – not much has changed since. African plantation workers toil in all countries of Southern Europe for starvation wages, plus they live in miserable accommodations and are subject to racist attacks. The EU policy of isolation causes the supposedly undesirable immigrants from Africa to arrive as "illegals" in Spain, Italy and Greece, and fall into the clutches of unscrupulous employment agencies and landowners. Since they could be exposed at any time to the authorities, they take on even the most poorly paid job and have to accept it. Some times they’re not even paid. The once flourishing agriculture in Calabria and Sicily of the orange cultivation in the 19th and early 20th centuries a source of wealth - has fallen into crisis. Competition from Spain, thanks to the reserve of cheap labour from Morocco and cheaper geographical conditions can produce at a lower cost. The agriculture of Sicily would have collapsed long ago without the influx of "illegal" refugees from Africa. The main customers of the juice from Rosarno, is Coca Cola, which uses the juice for its Fanta-production. Due to its size and monopoly, Coca Cola can dictate the price it pays (€ 0.7 per litre) for orange juice. At that price it would not even cover the costs of production even if the farmers would pay normal wages. A report by the magazine “Ecologist” pointed out this connection between immigrant exploitation and the prices that Coca Cola pays the farmers. Coca Cola announced that it had made a contract with the farmers from Rosarno. However after a short negotiation period it was withdrawn. Instead Coca Cola buys less and less orange juice from Rosarno. Orange juice from Brazil is the new approach because the labour there is even cheaper than the payment for the African migrant workers in Europe. The President of the Farmers' Association Coldiretti Calabria even suspected that the multinational beverage companies have formed a cartel to keep the prices on the world market low. In turn, the EU provides a new scheme for the allocation of agricultural subsidies. Since EU grants are issued under the mounting surface and not by the quantity of production, it has become more profitable for farmers, not even to have their oranges picked. Refugee and human rights organizations say that in the situation of African labourers had not changed at least not for the better. Many of them are unemployed, as in Rosarno and depending on the help of charities. A glimmer of hope represents the SOS project Rosarno. The anti-Mafia and Fair Trade organization have raised baptism of consciousness. 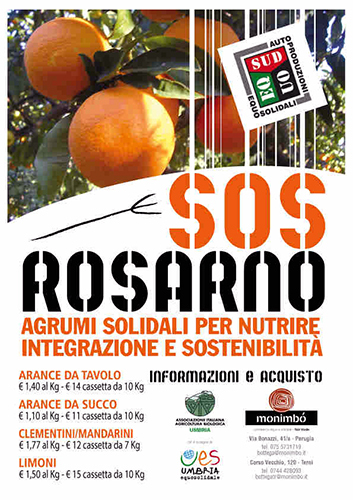 They have brought together small farmers who produce organic oranges for the distribution network "Acquisto solidale" (solidarity-based purchasing). They combined network merchants from the north of Italy to buy a product at a fair price and sell it accordingly more expensive. Establishing being employed in the SOS Rosarno establishments will enable up to 50% of the African day labourers, to fair wages with regular contracts. 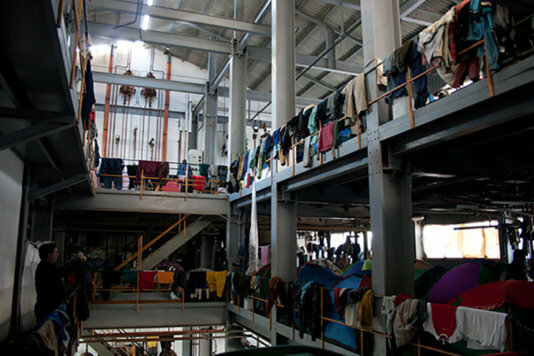 Rosarno is a place where not only the plight of migrants in Europe is visible, but also the lethal effects of globalization, in which the large corporations dictate the rules, and the EU misguides agricultural policy.